So, for most designers, the iPhone is the mobile of choice. But for most of those designers, the phone's camera is, well, rubbish: just 2 megapixels, and a cruddy lens to boot. But, help has arrived in the form of a couple of deeply tasty downloadable apps that let you process your shots on the phone. We've secured the services of two 'resting' members of top pop combo Gorillaz (2D and Murdoc) to demonstrate those apps. First up is 2D and the delicious QuadCamera from Art&Mobile. This application lets you fire off a salvo of shots, just like you might with a Lomo Super Sampler toy camera. Utterly brilliant. You can adjust how fast they shoot; which layout they come in (a rectangle of four, four in a row, a rectangle of eight, or eight in a row); and whether they're colour or greyscale. We've pushed the colour/contrast on the shots above (using Photoshop), but even without doing that, they look great. Next up is Nevercenter's CameraBag app, which lets you apply some groovy filters to your shots, re-creating a whole variety of retro styles like Holga, Fisheye, and Lomo. (We're guessing there's some kind of copyright reason for them renaming Holga to Helga and Lomo to Lolo). It's still a bit buggy, but generally does great stuff. Here's a selection of shots of Murdoc using some of our favourites. Lush eh? Check out the full size shots over at Alistair's iPhone Flickr set. Thanks to 2D and Murdoc. We've got a fairly substantial toy collection here at We Made This, ranging from comic characters to the Tango doll produced a bunch of years ago. Well they're toys in as much as they're funny and brightly coloured and accessible. My character Fat Boy was produced by Howies clothing company as a toy called Doh Boy. Another called Coot is coming out soon. They're art in as much as they're fairly 'adult' in subject matter, are hand made and I sell them in galleries rather than toy shops. They are also art because they are straight from the heart. Check out his Howies character here. We've been enjoying Ace Jet 170 for a while now, with its postings about "Found type, print and stuff". We were particularly revved up when we saw their latest post, all about the View-Master Stereoscope, and couldn't help but post something in reply. Alistair's grandmother had a View-Master (Model G, fact fans), and no trip to her house was complete without a decent amount of time spent checking out scenes from around the world (and beyond! with the Apollo Moon Landing reel). He inherited the View-Master and the collection of reels, and the ones above are a couple of his favourites. 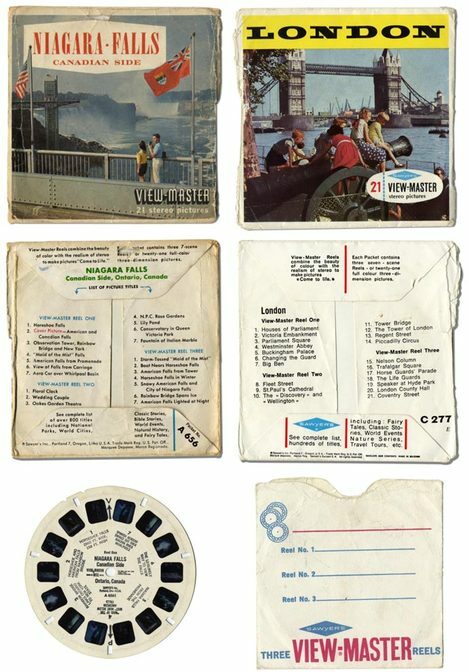 And, staying in the world of the View-Master, check out this place that can make customised reels for you, and the Fisher Price site with the current incarnation of the View-Master, and this world of 3-D gadgetry. 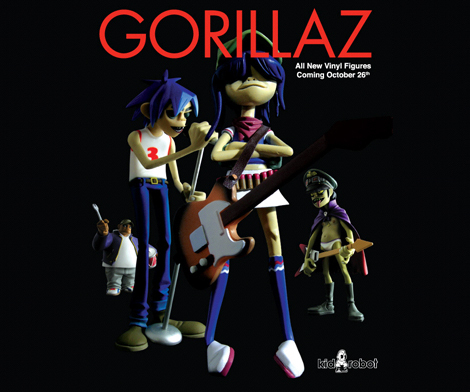 We totally failed to pick up a first set of the fantastic Kid Robot Gorillaz toys, so we were dead excited to hear that they're releasing a new set, in three different colour variations: basic, 2-tone, and white. The basic ones will be on sale from 26 October, and the others on 2 November (though that might be in the US rather than the UK). Yum yum yum yum. This fella's name is Klong. He cannot see or hear you, but senses your kindness. We picked him up at Playlounge as a present for a young relative, but then realised he was just too cool to let go, so now he's a permanent resident.